Situated at the Bangladesh – West Bengal border, Kingfisher Island boasts of a beautiful landscape surrounded by trees and flowing river. This pristine island is located between River Ichamati and Bhasa. This desolate island is covered by trees and is ideal for a day trip. You can reach Kingfisher Island from Hasnabad or Taki by hiring a local boat. 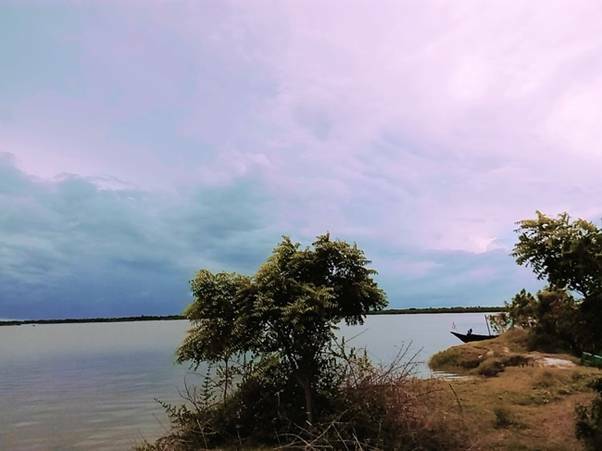 The island is nice for a nature walk over the green fields and in the distance you can see the villages of Bangladesh. Kingfisher Island is a secretive destination for bird lovers and photographers. You can visit Kingfisher Island throughout the year except the rainy season. Exploring the island is the most interesting thing to do. You can go there for a small picnic with friends and family. Fishing indulgence is also a good idea, you might catch a few sweet water fishes. Boating and swimming in the calm river are popular activities for the perfect combination of rest and fun. The island is a paradise for bird spotters. Brown-headed Gulls, Great-crested, Common, White-winged and Little Terns, Greater and Lesser Sand and Kentish Plovers, Curlews, Kingfisher, Whimbrels and a mix of other waders. Coastal forest birds are found in the island including Orange-headed and Tickell Thrush. As Kingfisher Island is a picnic spot people generally buy different fishes from Malancha Market on the way to Hasnabad. Taking stuffs required for cooking is a good idea.